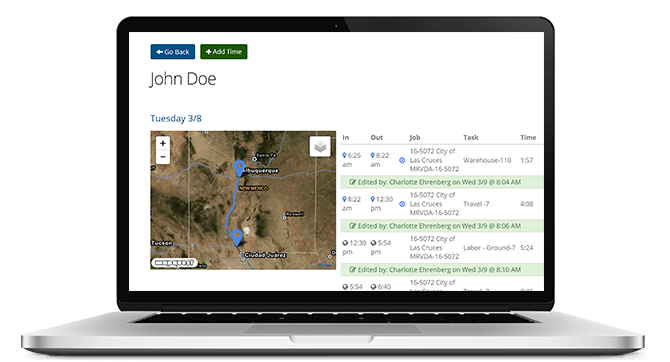 ClockShark’s GPS time clock app records location data from your employee's smartphones throughout the day. You’ll see a clear record on the timesheet of where everyone was when they punched the clock, as well as a breadcrumb trail of locations while they are on the clock. These GPS locations are shown on a map. The maps use satellite imagery to help you make out buildings and other landmarks. So you can easily figure out if employees are in the right place, or not. Who was where when? That’s an easy question to answer with ClockShark's GPS time clock app. Every time record includes GPS location coordinates. You'll know where everyone is when they clock in or out. Anytime you want to see where anyone is, or was, you can. In case you’ve got any junior hackers on staff, we’ve included tampering detection. So you’ll know if someone is trying to fake their location. Don’t try to guess who’s shooting straight and who's trying to put one over on you. With ClockShark you know the data’s good. We have been using this product for about a year, and I cannot tell you the amount of money we have saved based on the rounding from old paper timesheets, and the foremen not having to track everyone when they show up. We also love the GPS location, as this makes it easy to spot when someone has clocked in or out away from location. This often saves 3-5 pay hours per week, because we notice this and adjust the time. Most employees are honest. But all too often a few dishonest employees cheat on timesheets. The honest employees don’t mean to cheat, but they do round up. It’s estimated to be a 3.7 trillion dollar global problem. The Association of Certified Fraud Examiners reports on average, payroll fraud goes on for three years before it’s caught. By including GPS location data with each time record, you know whether people were on the job site or at home when they punched the clock. No rounding or fudging. Get ready to stop payroll fraud and rounding dead in its tracks. We Love ClockShark. Great timesheet management! Very helpful to have the GPS feature to make sure employees are clocking in at the job site. ClockShark makes it easy to get GPS tracking information without buying or installing special equipment. With every time punch from the iPhone and Android mobile apps, see included GPS tracking data. All you need to get location data is the smartphones your crew already has in their pockets. There is nothing to configure or install except the free GPS time clock apps. No need to get out the tools to bolt some bulky boxes onto your trucks. You got phones? You got GPS tracking. We are a construction company and boy has this helped us with our payroll! The smartphone app that our employees use for clocking in and out is easy to learn which is a great plus. We are very grateful for this affordable service! If you need more location data than where people are when they punch the clock, you can get a breadcrumb trail of locations during the the day by enabling GPSTrak™. Turn it on or off for each employee, individually. Are your guys skipping service calls and work stops? Did they stay on the job site? You can get these answers without any extra effort from your employees. Just open your laptop. GPSTrak™ makes it as easy as checking a box. If only everything was this easy. We've been with them since almost the start. There app is easy to use, I am able to keep track of my employees, even seeing where they are. Up to the minute. Payroll and time tracking has become much easier since using this app. I would recommend this, give it a try. You will be happy, so many features. See Who’s Working Now, and Where. Want to see who's on a job site? Have an emergency service call and need to see who’s closest? Then the Who’s Working Now feature in ClockShark is for you. Who’s Working Now is an easy to read map available on the website. You can see the position of each employee when they used the time clock last. You’ll also see a breadcrumb trail of their locations since the last punch. The map updates in real-time whenever there's new data received. You'll always see the latest and greatest. These aren't reruns. This is real time. I researched lots of time keeping systems. As a concrete company we needed a system that would be easy for our foremen to use as well as our office to track and pull reports. This system is perfect for our needs. The office can see who is currently working and at the end of the pay period it is easy to get reports to process payroll. CrewClock™ is a feature that we love and use everyday. This app/system is the best one we have used.